I know I post about this A LOT but surgery is probably going to happen next week and of course I am absolutely freaking out. I know the vet will explain everything to me, but I need something to calm my mind down a bit. Has anyone had this or something similar on their dog? How long does recovery take? Will she be in a lot of pain? How active can she be after she's healed? Are the risks of re-injury greater? 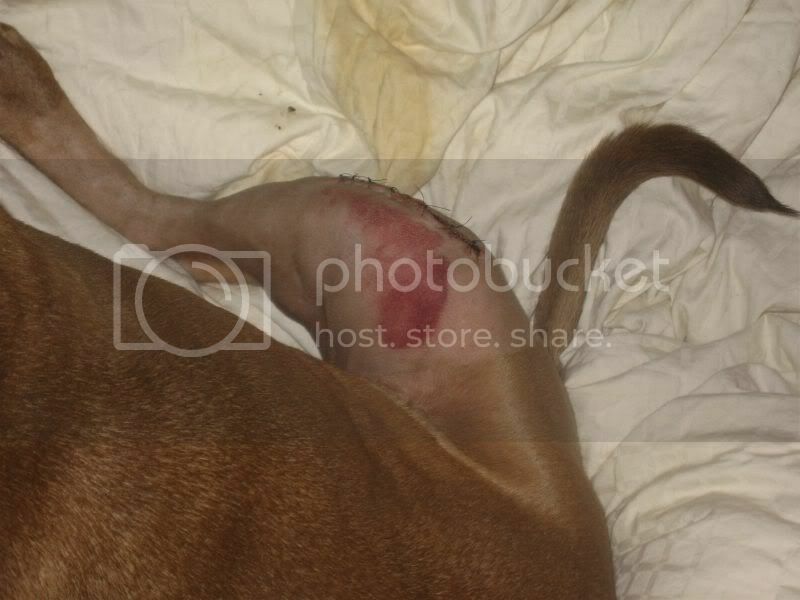 Will she still have arthritis in that leg or will that go away after the surgery? Are you having traditional repair or the TPLO? What is traditional repair? And TPLO? All I can go off of is the sheet the vet gave me for the ref feral place, which I believe says "torn CCL." I'm not sure of the style of surgery we will get yet, I know there are two, I'm leaning towards the less expensive one. The less expensive is traditional repair - The conventional, surgical treatment, this procedure involves sewing a strong surgical suture around the knee joint to restore normal position and stability of the femur on the tibia. 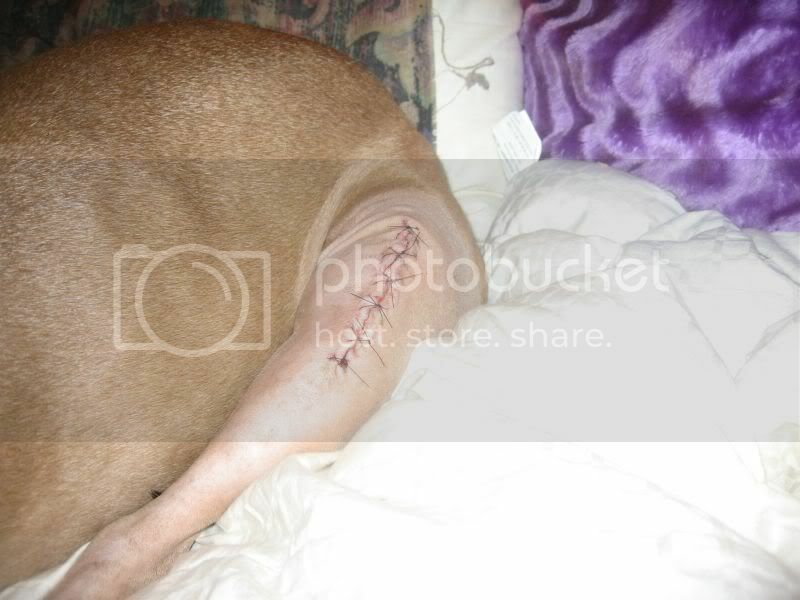 The suture provides support and performs a similar function as the cruciate ligament. The TPLO # Tibia Plateau Leveling Osteotomy (TPLO): This procedure levels the slope of the tibial plateau so the cruciate ligament isn’t necessary to keep the femur from sliding down the plateau of the tibia. Surgery involves cutting and rotating the top of the tibia, then screwing a bone plate into place so the bone will heal in its new position. igament and is held in place with pins and wires. # Tibia Tuberosity Advancement (TTA): Similar to TPLO surgery, TTA stabilizes the knee joint by changing the geometry and physics of the knee and enabling it to work without a cruciate ligament. TTA surgery may be less invasive and quicker than TPLO surgery. Zoe had the traditional repair done. Right leg completed 12/06 and left leg completed 5/07. So I will quickly share my experience on that surgery. She was down, hard, a few days. Lots of bruising in the area. In pain the first few days. 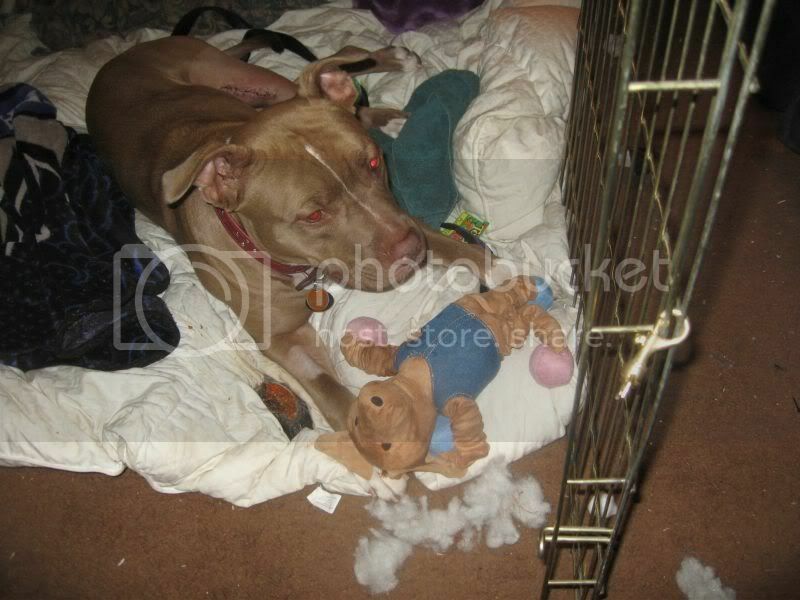 kept her on the leash for first few weeks so she would jump run etc... Zoe also had incontinence after both surgeries. Slowly started to exercise her. I have taken Zoe to a holistic vet - she praised me up and down for getting the tradition repair. The TPLO totally changes the form of the leg and no amount of chiropractic adjustment can ever get the leg back. I was told by her, that in the long run the TPLO causes more arthritis. But then the surgeon who does the TPLO and did Zoe's xrays, says the traditional repair causes more arthritus in the long run . It is hard to see your dog in pain after the surgery - and way they look...My vet also had me come back in the following weeks for quick check up to make sure all was going well. 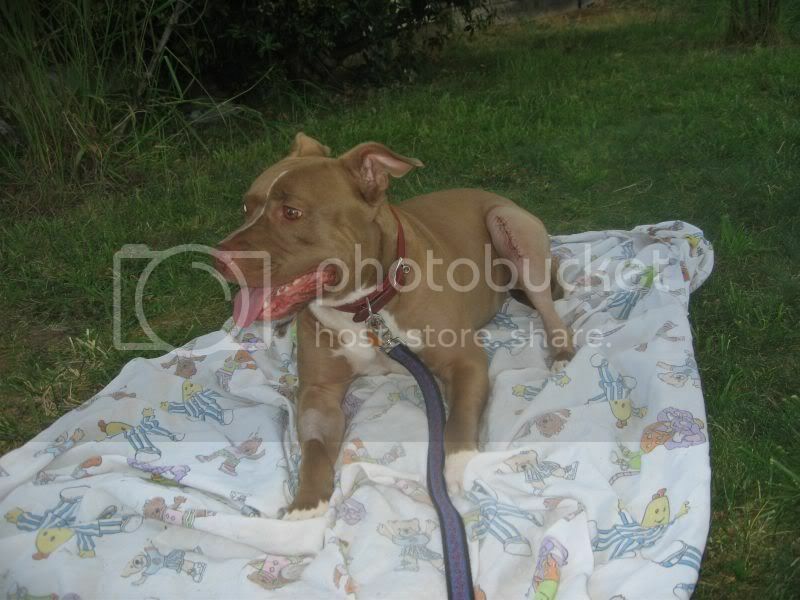 Skylar also had the traditional repair in both back legs about two years apart. He does have som mild arthritis but is on supplements and is doing great. 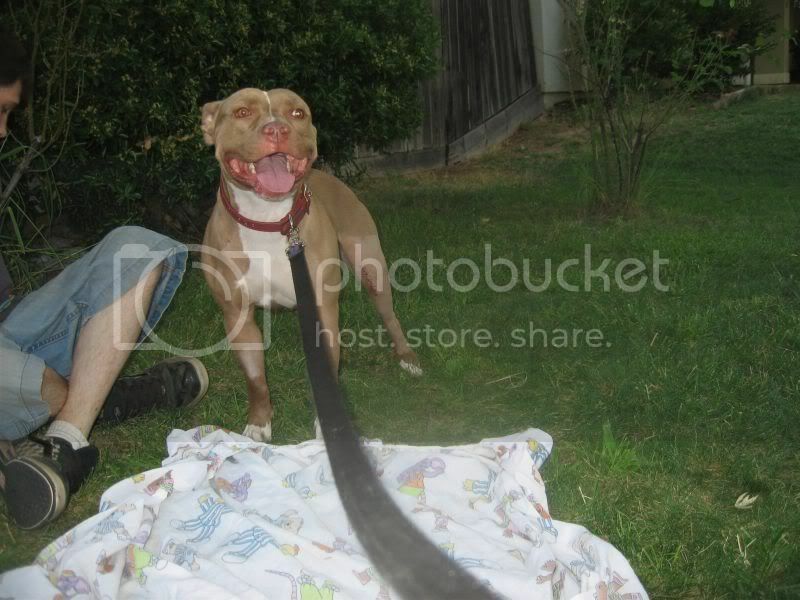 He was down and out for about 3 days and then he was leashed walked for 2 weeks. The traditional repair has a shorter healing time. It has now been about 2 1/2 years since his last repair and besides being slower to get up (he is 11 1/2 years old ) he can still run around just like old times. It was well worth the surgery. His knee was bruised for some time and looked quite painiful, but Skylar is a tough cookie so he did not show any pain. Luce had a traditional extracapsular repair done last summer. She really was not as painful following surgery as I expected. She had a big fat bandage, and she was walking on the leg the day after she came home (so two days after surgery). She came home on Rimadyl and Tramadol, as well as antibiotics. She was on strict complete crate rest for two weeks, and then I was able to start slow leash walks for five minutes at a time, and slowly built up from there. She was released to normal activity after 12 weeks I think it was, though she still limped until about the six month point. I'm not extremely overjoyed by the results of her surgery. She's more uncomfortable in the knee still than I think she should be, but she's definitely better than she was before surgery, so I guess that's the bottom line. She is having surgery on the other knee next month, probably a TTA this time around. All the information was great! I'm sure she'll be fine, I just feel so bad because for the past year she hasn't been able to be active without pain. I want her to feel like a pup again...but I guess a little relief is better then none. When you say your dogs were strictly left in the crate did you take them out to go to the bathroom or just leave then in the crate? Jez had the traditional repair on both legs. She had (and still has 5 and 6 years later) a lot of compications however I firmly believe that it's b/c the first vet I went to put her on crate rest for 8 weeks and then 6 more weeks instead of surgery before I got a second opinion. I've had foster dogs that have had TPLO and in my experience the dogs with TPLO heal faster and regain more function post op BUT it does totally change the leg and there are reports of osteosarcoma at the plate. No matter which surgery you choose the key is to have a good pain management plan for the dog and to prevent any slipping, falling or scrambling after surgery which will stress both the good and "bad" leg. My vet gave me exercises for rehab and highly encouraged swimming because it helps strengthen the muscles without any stress on the joint. 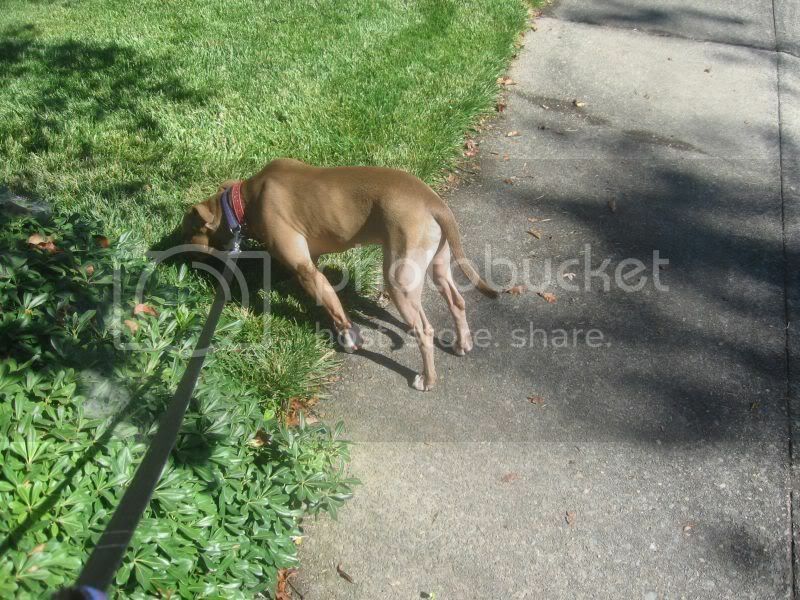 Leashed potty walks. You can sling them to keep weight off the leg for the first few days. Martin had Bi-Lateral Extra-Capsular repair (meaning both knees done at the same time) almost one year ago to the day. I know exactly how you feel and how scary it is. I also know how good it feels to see them romp around again. I used an x-pen instead of a crate, I wanted him to be able to turn and stretch out however he wanted, while controlling his activity. What to expect- She will be out of it when you pick her up, the anesthesia makes them whiny as well. So you will be freaking out trying to decide if they are in pain or it's just the drugs wearing off. The first night and the next day are hell, as you try to over-analyze every breath and worry over the logistics of when to take them to the bathroom and how to do it. Then it gets a LOT easier, becomes a routine. Then you are worried about keeping them quiet, even more fun. Turns out, it's normal bruising and you are a worrywart/spaz, though they won't say that. By day 9, can walk to the edge of the lawn, whoo hoo!!! And this is a dog who had BOTH legs done. I love the Martin bunny-hoppin' in the grass video! Good luck with Ashes' surgery. I am still going to have to work everyday after her surgury which is going to be hell... Does anyone know if it would be worth it to bring her with me or would that be way to stressful for her? She gets stressed out when I'm not at home...I worry the stress of sugary and me being gone might really bother her. My girl, Cobi, just had thyroid tumor surgery, has a 6" incision with staples in her throat and, trust me, she's with me EVERY day at work until they're out. In fact, she's laying under my desk right now, crate door open, eyes closed. Bring your dog to work if you can! I'm grateful my boss is allowing it - he's not a 'dog at work' convert but he does come check on her at least once a day. I did bring Zoe with me to work a week after surgery.